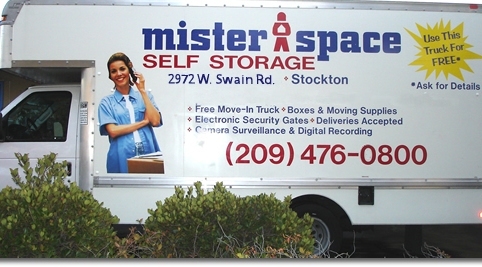 Mister Space Self Storage FREE Move-In Truck! *Severe penalties for late return of vehicle. The Courtesy Truck is not available on Sundays OR on any day when rain is predicted. Tenant or designated driver must be at least 21 years of age and must present a valid driver’s licence and (written) proof of (California) automobile insurance. Courtesy Truck is a Non-Smoking, two (2) passengers ONLY, vehicle. The driver is considered one of the two passengers. A reservation for the truck will not be made until after your rental is finalized.